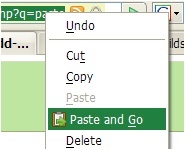 Paste and Go is a Firefox extension that adds an extra option to, well, Paste and Go when you paste a URL in the address bar. No need to hit the Go button anymore. It actually replicates a function found in Opera that I found very helpful once I trained myself not to instinctively hit the Go button.